This is the slimmer of the two species of Washingtonia and considered to be slightly less cold tolerant, though it grows considerably taller than the foregoing. When young, the two species are not easy to tell apart, though it becomes increasingly evident as they mature. The Washingtonia Palm is often the first choice of the street planner, influenced no doubt by its ready availability, fast growth, and consequent low price, but also by its many virtues as an avenue tree. 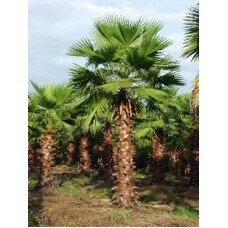 The Washingtonia Palm is a cold hardy palm and rated for Zone 8b. The Washingtonia palm can tolerate frost and temperatures into the low 20's. This is the slimmer of the two species of Washingtonia and considered to be slightly less cold tol..